If you haven’t been listening to the news on their film ‘The Lone Ranger‘, the film hasn’t made much money. In fact the film cost upwards of $215 million, and that was a smaller budget than what was originally given. The film has made only $175 million worldwide so far, and it’s been released for more than a month. This has been a running story this summer with big Hollywood blockbusters. 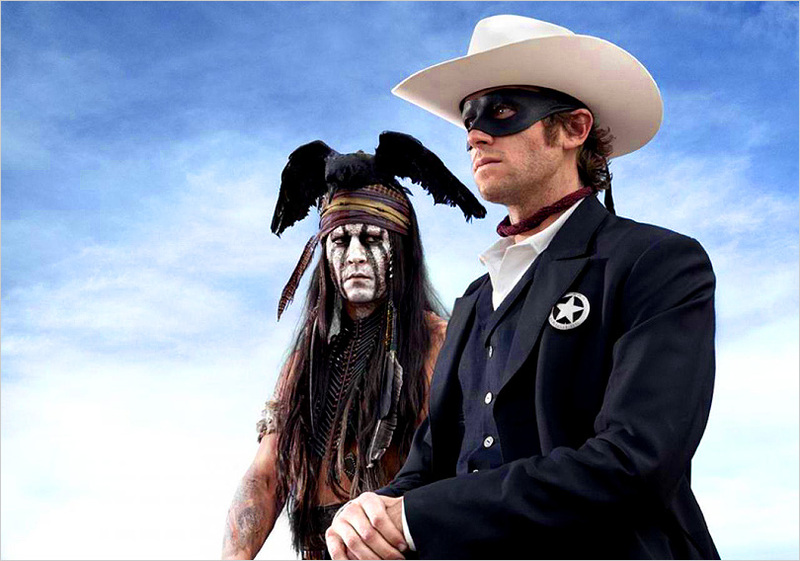 Several films this summer with mega budgets have underperformed these past few months, with ‘The Lone Ranger‘ getting the worst of it. It looked good on paper. You have Depp and director Gore Verbinsky teaming up again from their work on the ‘Pirates’ movies to make another supposed big budget franchise with ‘The Lone Ranger‘. Everyone involved was hoping for $1 billion in ticket sales at least. We are currently far from that. Now, here is where it gets interesting. Armie Hammer, who played The Lone Ranger and recently played the Winklevoss twins in ‘The Social Network‘ blamed American movie critics for ruining their movie and preventing it from making money. He even went on to say that all of the American Movie critics wrote their reviews before seeing the film due to the many production problems and delays ‘The Lone Ranger‘ had. Let it be known, that they both came out with these statements once they were on UK soil, meaning after they left the US press tour. First off, saying that all of the American Press reviewed you film that early is laughable as well as incorrect. On the contrary, most of us critics weren’t allowed to screen the film until a few days before its release, giving us only 48-72 hours to finish our reviews. And maybe with the exception of Rex Reed, I don’t known any professional film critic who would write a review before seeing a film. Let’s add to this, that myself and everyone I talked with, including fans and critics were super excited about seeing your film. I know I enjoy watching both of you (Depp and Hammer) on screen. And when I heard that Verbinski was using real trains, I became all giddy as we haven’t had a good train movie in a long time and was super stoked to see the Wild West come alive again. Well, for those of us who saw the film, we were surely disappointed. I can go on and on about what’s wrong with the film, but that’s not what this is about. This is about accusing a large amount of people ruining the success of your movie by writing an opinion about it before the film was finished. You two are acting like a couple of little children who are clearly clueless of your own film and what goes into a film critique. I’m huge fans of you both and will definitely be seeing your future projects, but just because your movie is unsuccessful, you don’t need to go around blaming film critics. Instead, I suggest actually sitting down for the long 150 minute run time and taking a close look like we all did. You might change your mind. This entry was posted on Wednesday, August 7th, 2013 at 1:36 am	and is filed under Film, News. You can follow any responses to this entry through the RSS 2.0 feed. You can skip to the end and leave a response. Pinging is currently not allowed. « Harrison Ford Joins ‘Expendables 3’!! !